Disclaimer: I am writing as a layman who do not work in this industry. What i write is what i read and interpreted. I am a noob. The poster child of Singapore has runned into difficulties. So what led to its fate? It has been stated that Tuaspring is the one that broke Hyflux due to the excess capacity in the local electricity market. Hyflux is unable to sell Tuaspring at book value due to losses, so she is unable to repay creditors, suppliers and other securities. So why is there excess capacity in the local market in first place? 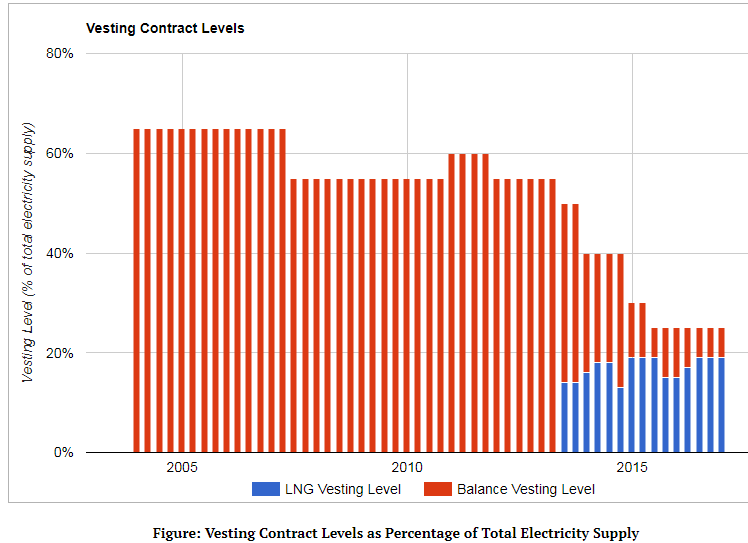 From my limited understanding, to curb Gencos from exercising market power, Vesting Contracts were put in place between SP power ( the distibuter of electricity) and the gencos. Each Genco is commited to sell a fixed amount of electricity (MWh) at a fixed price, called the Vesting Price. The intention was to prevent monopolistic behaviour. The excess electricity after satisfying the Vesting Contract can be sold in the market at the USEP price. Read here for more information about Vesting Contracts and how it prevents monopolistic behaviour. 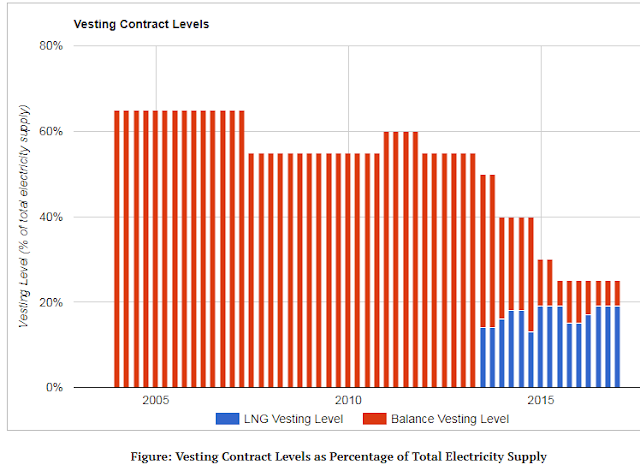 Now, it seemed that the Vesting Contracts were actually attractive to the Gencos since the Vesting Contracts provided some form of predictability as compared to letting the full revenue be based on market determined prices ( also refered to as USEP, Uniform Singapore Electricity Price). With predictability, Gencos could measure profitability more easily and calculate whether to invest in a power plant. Apparently, many of the Gencos were incentivised to invest which led to a glut. Here is the list of Gencos coming online during 2013 - 2014. The flood of installed capacity came about during 2013 and 2014 when most were built. But to the dismay of the Gencos, the Vesting Contracts for them were sharply reduced in about 2014 onwards. This meant that Gencos are now much more exposed to the vagaries of market determined prices ( USEP) as only a smaller percentage of their electrcity can be sold at fixed prices. Given the over building of installed capacity, the impact of USEP was even more pronounced. See the average prices in the red box below. The average USEP reached a 13 year low of $43.6/MWh in April 2016! About the same time, Hyflux BTWZ was offered to the public! The general prices after 2015 is the lowest in the 13 years shown. The decision to reduce the Vesting Contracts (which mean reducing the committed quantity sold at a fixed price , also called Vesting price) affected the Genco so much that they were vocal in their feedback. Emphasis through underlining is mine. However we also believe the vesting contract provided market stability to all stakeholders, stable prices to consumers and stable revenue for the investors. How about the Vesting price? It seemed that the Gencos were also vocal in their opinion on the parametes used to calculate the Vesting price, deeming it insufficient. A smaller amount of committed quantity at a lousy price...what a double whammy..
You can find the information here and see the reply by the regulator. "Why do you look at the speck in your brothers eye, but fail to notice the beam in your own eye. " The biggest blame is the stakeholders themselves for making a market decision to be vested and when market information is readily available. I don't think it is fair to also attribute the failure of Hyflux to purely market forces. And to some of you who wonder why your electricity prices don't seem to be cheap or is even increasing even though Gencos seem to be losing money . Just remember that Gencos are not the only market participants in the electricity market. Read here to find out who are the market participants. Certainly, it is NOT the Gencos who are making the money. On a positive note, the USEP prices have been increasing, which bodes well for the Gencos. From my dickhead experience, it does seem that if the USEP prices were to improve and Hyflux given some breathing space, it has a change to recover. BUT read disclaimer below. Disclaimer: I vested in some BTWZ and i am a layman who is just trying to understand.